Excitement brewed over the weekend as the opening address and sessions of the International Wine Tourism Conference edged closer. The conference began on Monday morning with an introductory address by Chiara Lungarotti of Lungarotti Winery in Umbria. 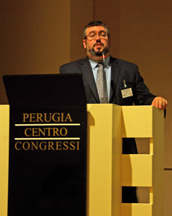 Dignitaries spoke for several minutes with a theme of welcome and the need for continuing to build wine tourism in Umbria. Words such as “welcome” and “important” were frequently used to establish the importance of wine tourism with other segments of the community such as cultural locations and hotels. This is a wine tourism conference. So the opening plenary session titled “Wine Tourism Does Not Exist, There Is only Tourism” was a bit unsettling at first. The speaker, Mike Wangbickler DWS CWE, Balzac Communications & Marketing, USA, discussed that wine regions were somewhat alike and tourists are tourists. Wine regions compete with other wine regions as well as other tourist attractions. His first issue looked at: are people interested in wine or tourism? He suggested that it is tourism first then wine. Mike believes that tourists are interested in the experience. The second issued raised is: how does a wine region communicate? He suggested that tourists are not all the same and each should be treated differently. His third issue looked at what makes a wine region stick out among other wine regions. Mike stated that it is the experience that people get when visiting a winery in a region. Wineries in a region can draw people in by offering experiences other than wine tasting. Tourism makes everyone money, not just the wineries but also hotels, restaurants, sites and activities. Mike summarized his issues by saying that wineries want to sell the experience. Mike then gave a case study of Napa valley discussing how the area became a wine region. Marcello Lunelli and his brother Alessandro gave some background about who they are and the Lunelli family. Marcello spoke of their Ferrari sparkling wine. The Ferrari sparkling wine has received awards for nearly 100 years of the family’s 110 years of making wines. By 1969 production reached 100,000 bottles. Marcello showed a photo of their Trento winery that looks modern and artistic. At the winery twenty million bottles of sparkling wine rests. Pictures of their Villa Margon showed a beautiful villa restored by the Lunelli family. The 16th century villa serves as a group hospitality center. Art works abound both in and outside the villa. Marcello described some of the wines produced by the family. It is easy to see that the family sees the production of wine as art. The family is opening a facility in Umbria that they believe can capture tens of thousands of visitors as their Trento facility. The Umbrian winery was not created by an architect rather it was created by a sculpturist, Arnaldo Pomodoro. The artist visited Umbria and became inspired by the area and the grapes. A model was built and construction began. When a sculpturist designs a building there are many renditions along the way that creates a true “work in progress.” The outside of the building is a carapace. The winery will open in a few months. It is a feat of art, both of a sculpture and wine. Presented by Julie Pegg a journalist for realfootraveller.com and EAT Magazine, Canada, treated attendees with beautiful photos of Oregon, Washington and British Columbia. Julie easily used maps to describe how to reach various locations in the Pacific Northwest including Vancouver Island by ferry. Her presentation while low keyed presented reasons why everyone should visit the beautiful Pacific Northwest. Some of the wine regions mentioned to visit included Willamette Valley, Columbia Gorge, Yakima Valley, Walla Walla and Vancouver Island. A few of the individual wineries mentioned included Michelle St. Marie. Roie Edery, Aleksey Klempner and Mark Thompson created Celebrity Wine Review TV. Mark Thompson, that has a television background and a very recordable voice, showed a clip of Chef Fabio Viviani bringing to the television audience his passion for food and wine. The television episodes showcase wine as they are showcasing lifestyle. The television series also has a web presence. Alexksey Klempner spoke of the web presence and social media. When the website began it had good content, but lacked a large audience. Their strategy was to use many online social media outlets. Alexksey spoke of SocialOomph.com. a tool that can be used to help to increase online productivity. David began his presentation with how present day businesses use technology to demonstrate their products. Examples of these business included Legos, cars, Potterybarn and clothing manufacturers. 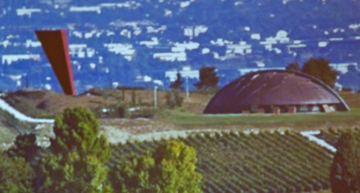 David used winery and vineyard photos to show how to enhance a simple photo. Consider using balloons with information inside to provide more information. David also talked about the benefits of using QR codes. Rather than using just the simple black and white matrix blocks, David suggested using QR codes with more personalization including colors and images. Lunch was a long time to enjoy meeting more people and enjoy Italian cuisine. The luncheon was in the Orleans Restaurant which is a large room in the hotel. The restaurant was decorated with music symbols including cymbals and French horns. The tables, with light yellow tablecloths, had old records on the tables to be used as placemats. Unusual, but a great use for unwanted records. 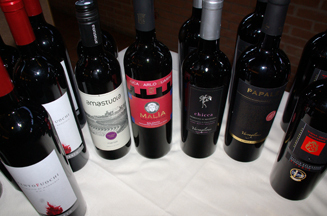 Numerous wines were available to be paired with the various courses. The Appetizer was Cardoncello mushroom with thyme and burrata from Andria. The starter course was of pureed artichokes with strong sheeps’ milk ricotta and very thin slices of Altamura bread. Altamura is a small area in Pugila. The First Course was toasted wheat orecchiette pasta with turnip tops, cherry tomatoes and chickpeas from the chef’s own garden. The second course was slow-cooked pork capocollo potatoes, lampascioni onions, spring onions and thread tomatoes. Dessert was dark chocolate terrine with a soft pumpkin centre. Mary Cressler’s presentation included several points of importance to encourage tourists to a winery. These included: telling your story, updating your story, create an experience around your products, on tours point out something different and share your story with tour companies. She included about how a winemaker compared Chardonnay to chicken. He liked to make wine with Chardonnay grapes because there are so many things you can do with it – just like chicken. Laurence Cogan defined wine tourism experience as a mixture of experiences generally at wineries. Laurence commented that France is the number one wine tourist destination in the world. In France, there are examples of wine tourism such as: scenic wine routes, professional cellar visits, walking and biking paths, wine education centers, wine festivals as well as cultural and historical heritage sites. There are approximately 10,000 wine properties open to visitors. They attract 14 million visitors a year, about 39% from outside France. Laurence described four profiles of French wine tourists: Epicurians account for 40% of the tourists, Explorers make up 20%, Experts account for 16% while Classicals (interested in a region’s heritage) are at 24%. Burgundy does have challenges, for example winegrowers see each other as competition and would not send tourists to a competitor. Laurence also mentioned the many stakeholders interested in the wine tourism movement as being a challenge. Laurence had suggestions for wine growers: post opening hours, provide wine notes in several languages, provide a picnic area and list other wineries that are open as well as other attractions. Jane Hunt mentioned her past experiences with wine tourism. One of the experiences she offered was the few times that she was treated coolly at a winery. Jane mentioned the importance that the first ten minutes at a winery property can last a lifetime, for better or worse. She noted that a poor experience can be remembered just as well as a great experience. Jane spoke of different wine regions. She really likes South Africa region near Cape Town. Other wine regions Jane has offered tours to include France, Italy, Chile and Argentina. She mentioned many wonderful wine regions in different countries throughout the world. Jane also mentioned some particle suggestions that wineries and tour operators can use to make a more pleasant experience for wine tourists.